Aligning models, concepts, measures, and evidence about how diverse students build their identity pathways through school to college and careers is essential so researchers, educators, and policy investors can collaborate productively and draw from advances across fields. To build a common language for these onging collaborations, BMWA events are designed to forge these alignments and map similarities and differences across cultural communities. • Cooper, C. R., & Seginer, R. (2018). Introduction: Navigating Pathways in Multicultural Nations: Identities, Future Orientation, Schooling, and Careers. • Flum, H., & Buzukashvili, T. (2018). Identity Development and Future Orientation in Immigrant Adolescents and Young Adults: A Narrative View of Cultural Transitions From Ethiopia to Israel. • Seginer, R., & Mahajna, S. (2018). Future Orientation in Cultural Transition: Acculturation Strategies of Youth From Three Minority Groups in Israel. • Waldring, I., Crul, M., & Ghorashi, H. (2018). The Ability to Deal With Difference: Turkish‐Dutch Professionals as Go‐Betweens in the Education Sector. • Schneider, J. (2018). “Ausländer”(Foreigners), Migrants, or New Germans? Identity‐Building Processes and School Socialization Among Adolescents From Immigrant Backgrounds in Germany. • Cooper, C. R., Domínguez, E., Cooper Jr, R. G., Higgins, A., & Lipka, A. (2018). Capital, Alienation, and Challenge: How US Mexican Immigrant Students Build Pathways to College and Career Identities. • Azmitia, M., Sumabat‐Estrada, G., Cheong, Y., & Covarrubias, R. (2018). “Dropping Out is Not an Option”: How Educationally Resilient First‐Generation Students See the Future. • Cooper Jr, R. G. (2018). What Develops in Cultural Transitions in Identities, Future Orientation, and School and Career Pathways? • Crul, M. (2018). Culture, Identity, Belonging, and School Success. • BMWA partners presented a symposium, Cultural Transitions in Identities, Future Orientation, and School Pathways among Adolescents and Emerging Adults in Two Multi-Cultural Societies, at the International Society for the Study of Behavioral Development in Vilnius, Lithuania, in July 2016. Four studies, conducted with Muslim, ultra-orthodox Jewish, secular Jewish, and Ethiopian immigrants in Israel and with U.S. Mexican immigrant and others who were the first generation in their families to attend college, will be presented. The symposium aligns concepts and evidence across theories, including Eriksonian (1968), Sociocultural (Flum & Cinamon, 2011); Bridging Multiple Worlds (Cooper, 2011); Future Orientation (Seginer, 2009); Intersectionalities in Social Identity Theory (Azmitia, Syed, & Radmacher, 2008; Tajfel & Turner, 2004; and Educational Resiliency (Cabrera & Padilla, 2004). • BMWA partners presented a symposium, Bridging Multiple Worlds: Innovative Partnerships to Educate Diverse Democracies Within Culturally and Socioeconomically Diverse Communities, at the American Educational Research Association in April 2016. Seven studies, conducted in Hawai’i, California, and Colorado, with Latina/o, Okinawan, Southeast Asian, Chuukese, Portuguese, Vietnamese, and Korean students and families, aligns concepts and evidence across theories, including Bridging Multiple Worlds (Cooper, 2011), Sociocultural (Vygotsky, 1978); Diverse Learning Environments (Hurtado et al., 2012); and Six College-Going Conditions (Oakes, 2003). • BMWA partners presented a symposium, Advancing Social Justice by Bridging the Cultural Worlds of Students, Families, Communities, Schools, and Universities, at the American Educational Research Association in 2015. Seven studies, conducted in Hawai’i, California, and Alabama with African American, Latina/o, Okinawan, and Southeast Asian children, adolescents, and college students, aligned concepts and evidence across theories, including Bridging Multiple Worlds (Cooper, 2011), Sociocultural (Vygotsky, 1978), Student Engagement (Nora, 2002), Schema Theory (D'Andrade & Strauss, 1992), and Cognitive Script Theory (Schank & Abelson, 2013). • BMWA partners presented a symposium, Who Am I? Where Do I Go from Here? Identities and Future Orientation in Cultural, Social, and Institutional Contexts, at the International Society for the Study of Behavioral Development in Shanghai, China, in 2014. 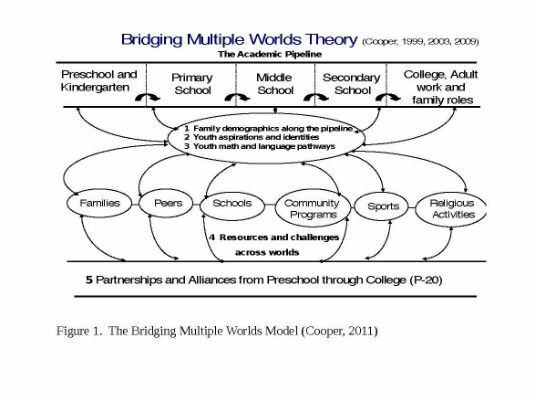 Four studies, conducted in the U.S., Israel, and Cameroon, aligned concepts and evidence across theories, including Bridging Multiple Worlds (Cooper, 2011), Future Orientation (Seginer, 2009), and Educational Resiliency (Cabrera & Padilla, 2004). • BMWA partners presented a symposium, Bridging Multiple Worlds: Innovative Cultural Partnerships among Students, Families, Schools, Communities, and Universities from Preschool through College, at the American Educational Research Association in 2014. Six studies, conducted in Hawai’i and California, aligned concepts and evidence across theories, including Bridging Multiple Worlds (Cooper, 2011); Sociocultural and Funds of Knowledge (Moll, 2013; Vygotsky, 1978); Frierean (Friere, 1993); Overlapping Spheres of Influence (Epstein, 2010); and Diverse Learning Environments (Hurtado et al., 2012).